Rather than inundate you with every new model present at the 2013 Calgary International Auto Show, we'll be going through select trends and details that caught my eye. Let's press the big red start button on the dash and get going! 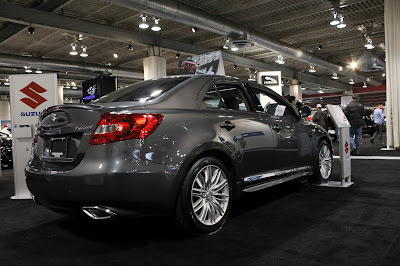 Suzuki made an interesting decision to make their Kizashi sedan bigger than a Corolla but smaller than a Jetta. It's neither a compact nor a mid-size. Between it's odd size and dwindling dealership netowrk, the Kizashi hasn't been the savior that Suzuki had hoped it would be. The Suzuki stand was a very quiet place all evening. Save the Suzukis! 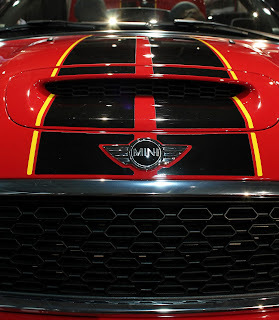 Subtle, however, has never been Mini's game and they brought this Mini Roadster sporting some bold stripes. 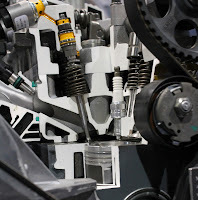 The Chrysler booth featured these cool engine cutaways of their various four cylinder engines. 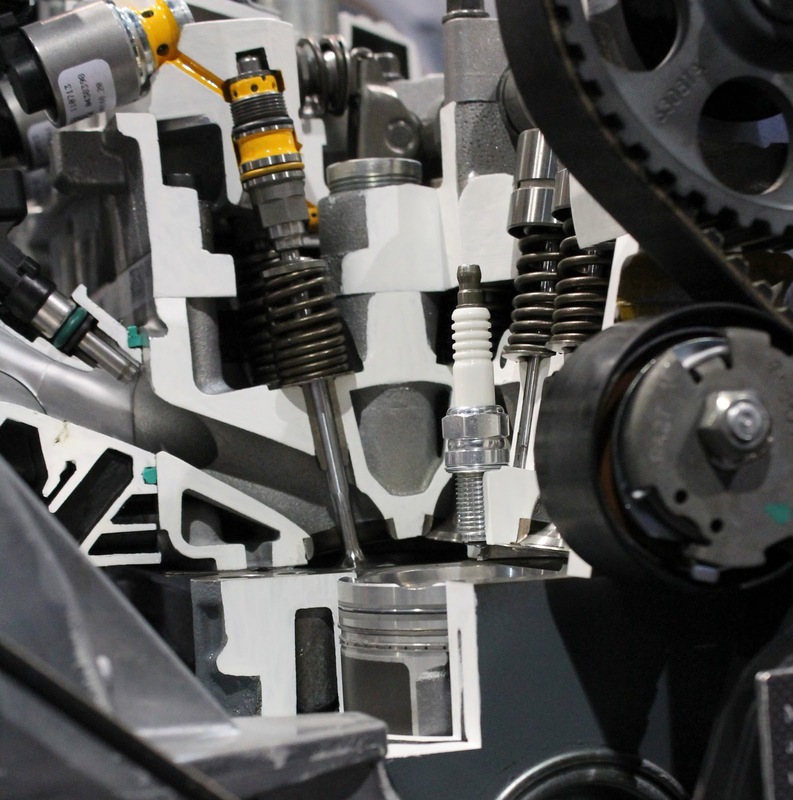 It's always fun to be able to touch and feel the parts of an engine without having to get your hands all greasy. Mopar boasted the best displays of the event. This Chrysler 300 SRT8 had a plinth all to itself. Makes an interesting contrast to the white Lexus sport sedan doesn't it? Which one would you rather have in your garage? Not a whole lot of romance under there. The Veyron doing what it does best, drawing a crowd. Hiding at the far end of the show in the most dimply lit corner was one of the most expensive production cars on sale today. Despite being, essentially, an eight year old design, the Bugatti Veyron still looks striking and modern. Who wants to imagine the maintenance costs for one with 250,000 miles? These aren't nearly as big in person as they look in pictures. In fact, the nearby Lamborghini Aventador looked bigger in every dimension but height. Looking fantastic from every angle, this matte Aventador was a treat to look at. It's nice to see one that's not orange. Bruce Wayne came up and bought this one off the display, actually. On the other hand, it's nice to see some bolder colors coming into vogue. These were on display at the Hyundai stand. Over in the GM camp, the open hood of a Corvette ZR-1 proved interesting to many show goers. Yeah sure. Nothing says "fun" like a slightly pink Chevy Spark. The kids want stance. And there were only two such cars on display. You had your choice of the already way too common popular stanced Scion FR-S or this fine VIP style Honda Accord. How could you lose? The Mazda MX-5 is one of the most honest sportscars you can buy today. And it looked sharp with it's contrasting black hardtop. Four across seating! Why is this not done in large SUV's? 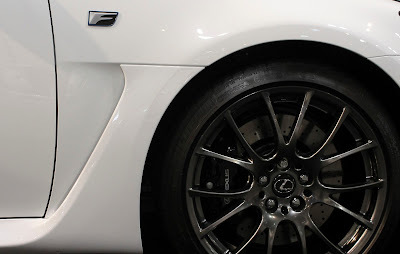 Interesting detail on a Mercedes AMG. Mercedes always seem to look great in silver. The Honda Gear concept was in attendance and was undoubtedly the most interesting car in the Honda booth. Its retro styling works well and hopefully we can see it enter production soon! 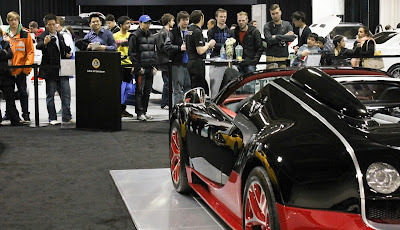 The 2013 Calgary International Auto Show could be summed up by the placement of the Bugatti Veyron and the tiny Mitsubishi I-MiEV. The most powerful production car in the world was placed right next to the least powerful production car in the world. 1,200 horsepower was 30 feet from 63 horsepower. Together, both cars represent the extremes of the modern automotive spectrum. But really they represent progress. Putting the world's fastest car next to the worlds most fuel efficient (I think) car just goes to visibly demonstrate how far cars have come and where they are going.